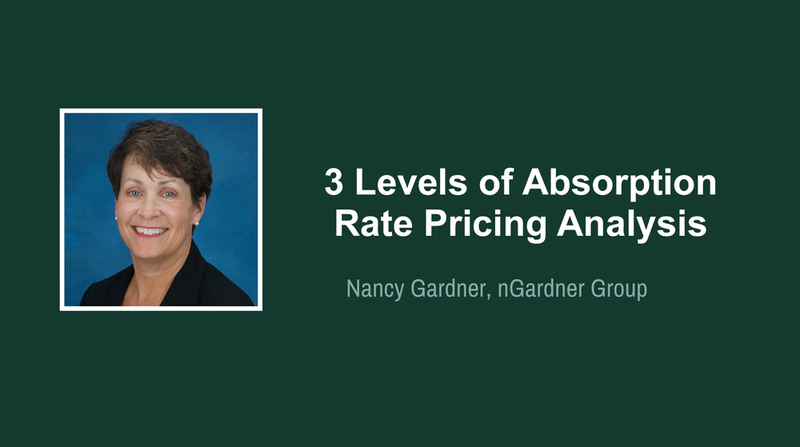 Webinar: 3 Levels of Absorption Rate Pricing Analysis by nGardner Group, Inc. If we can't price real estate, it's unlikely that we can sell it. If we can't sell it, why should someone hire us? Learn an updated approach to pricing real estate which benefits the Seller and the Agent. Nancy Gardner began her work with real estate companies and their agents in 1997. She continues to keep companies ahead of the mainstream and was one of the first to advocate the importance of relevant SOI relationships, tracking market data and generational preferences, along with absorption rate pricing, professional presentations and the emergence of agent production data availability online. Nancy focuses on changes in the consumer preferences and the importance of continuing to evolve around them. "It's about them, not us." Learn the 3 levels of absorption rate pricing analysis mastery. Learn an effective format to getting price reductions. President, N Gardner Group, Inc.